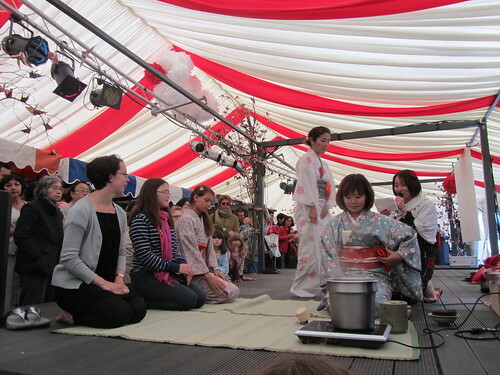 Having had such a wonderful time at the Brighton Japan Festival on Saturday, I went back for more on Sunday. 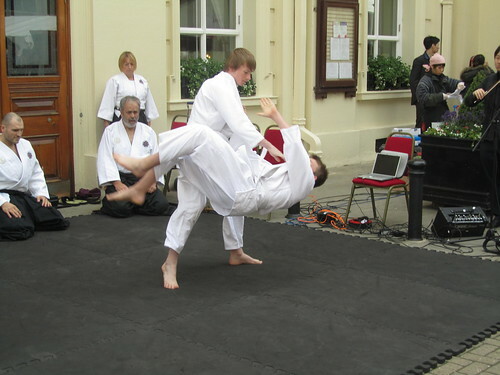 Now in their third decade of training, The Mid Sussex Martial Arts School (MSMAS) is now one of the oldest and most traditional non-profit, mixed Martial Arts Centres in the UK today, know internationally as Tenshin Kan UK Dojo. 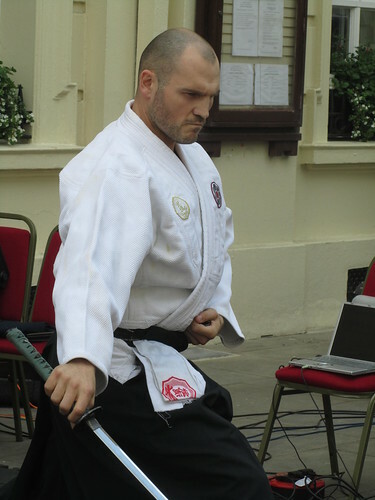 I don’t know anything about martial arts really, but I liked what I saw. 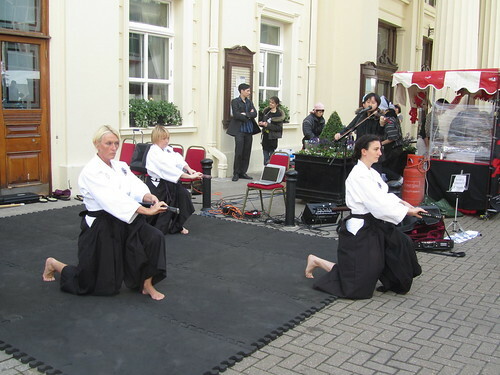 They performed a variety of different styles, including judo, kendo and iaido. 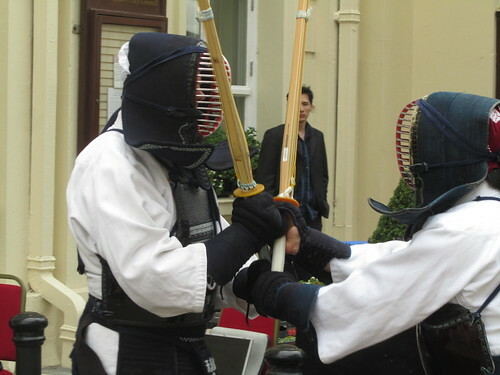 I particularly liked the kendo, which I have never seen live before. It was a bit scary though, as it’s so violent! Watch calligrapher Takako create a huge, stunning 3m x 3m piece of shodo (Japanese calligraphy) before your eyes! 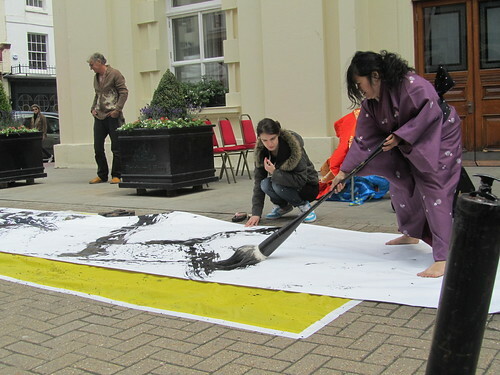 Unfortunately the wind caused quite a lot of problems with this event, but Takako Higgs still managed to create her giant calligraphy. In the video above, she is writing Ichi-go ichi-e (一期一会). This is a beautiful Japanese phrase, which means “one time, one meeting”. The phrase can be interpreted as “one chance in a lifetime”, and Takako also said that it implies that you should do your best when you first meet someone or do something so that you can make the best impression. 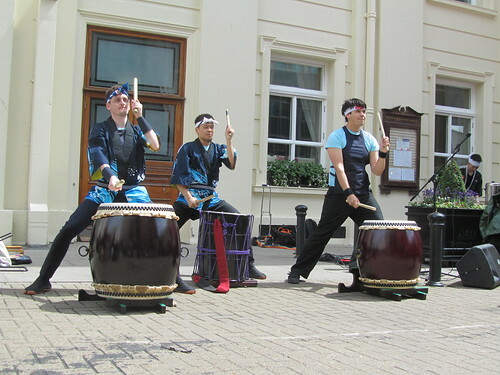 Taiko drumming is a particularly loud and exciting type of Japanese performance! In feudal Japan, this type of drumming was used to encourage the troops in battle. 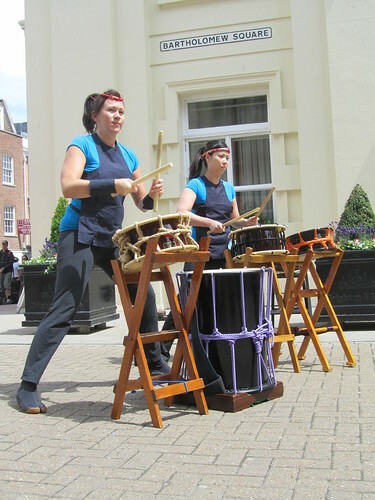 Discover taiko for yourself with a rousing performance. 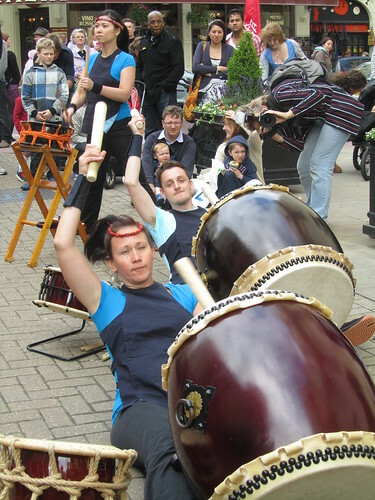 Kaikyo Taiko also joined in with other events, such as martial arts and giant calligraphy, to provide a live soundtrack. It produced a beautiful effect. 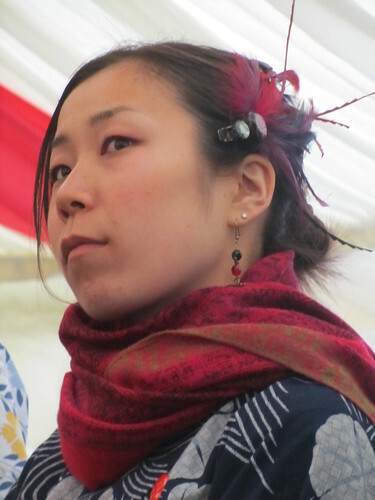 They also performed a collaboration with violinist Masa Futagami. 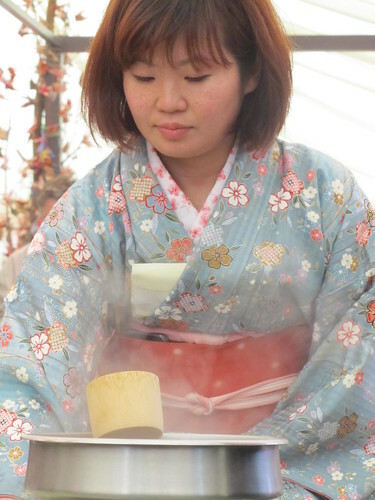 Watch an authentic demonstration of chanoyu (Japanese tea ceremony). Tea ceremony has existed in Japan since the 13th century – originally beginning with tea tasting parties by the samurai classes, it eventually evolved as an expression of the Japanese wabi-sabi aesthetic. 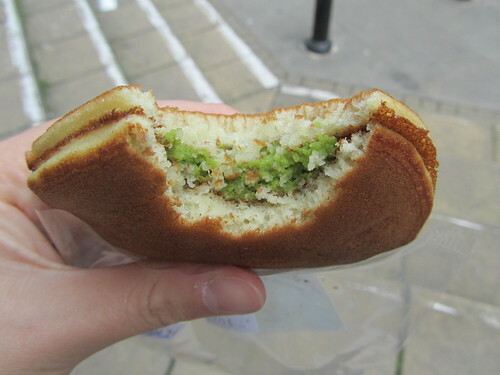 Selected audience members will be invited to take part in the ceremony and try the matcha (green tea) for themselves. 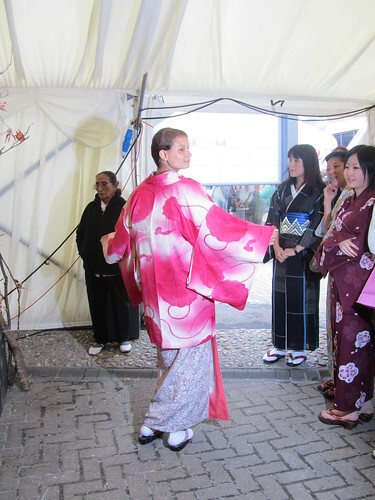 Models take to the catwalk wearing a beautiful array of authentic Japanese kimono and kanzashi with a modern twist. This “fashion show” turned into more of a kimono contest actually, but it was still lovely to watch. 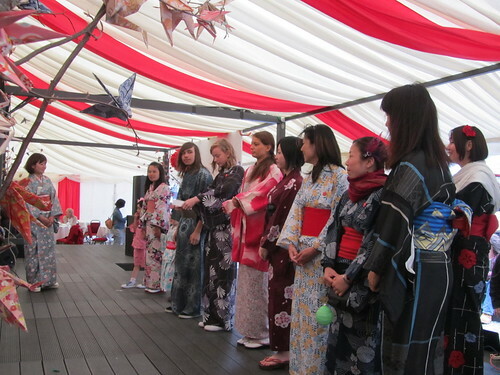 Anyone who attended the festival in a kimono or yukata was invited to go up on stage and be judged. 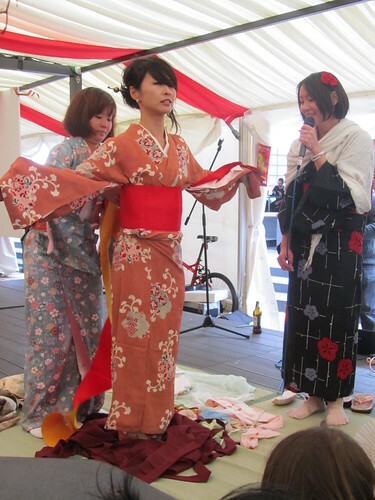 Some people borrowed kimonos from the shop Fuji Kimono, which had a stall at the festival. 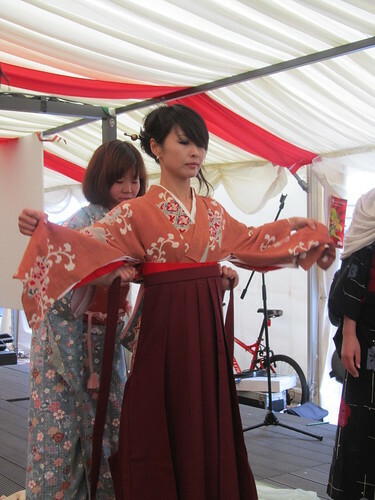 Wearing a kimono is really difficult, and most Japanese people can’t even do it by themselves. 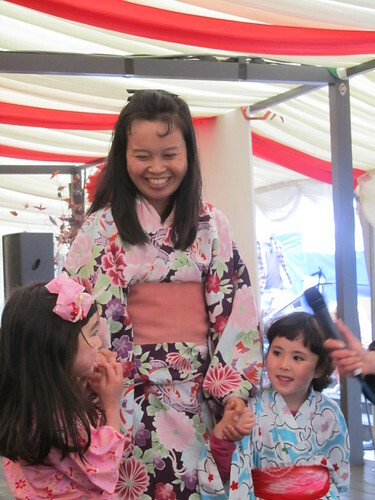 I was impressed to hear that many of the people wearing kimono and yukata at the festival were dressed at the festival, not by a Japanese participant, but by a non-Japanese girl whose name I’m afraid I didn’t catch. She also dressed herself beautifully, and quite rightly won the competition. Ever wondered what exactly is worn underneath a kimono and how all those layers manage to stay up? 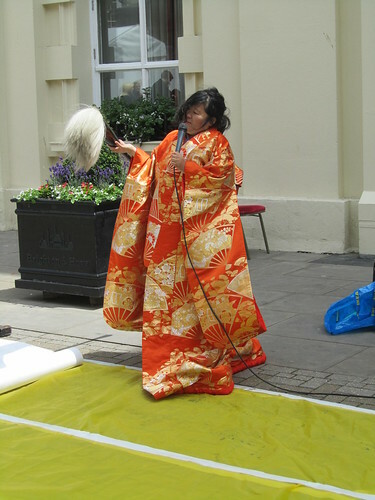 Join us for a step-by-step demonstration of putting on a kimono, along with some of the history and trivia associated with the clothing. After the model was dressed in a kimono, she was dressed in Hakama. Hakama makes wearing a kimono much easier, as you don’t have to worry about things flapping up and you can move more comfortably. 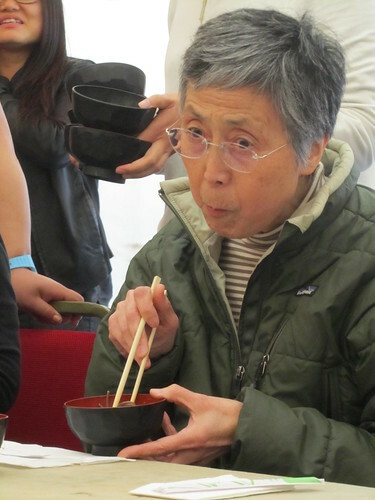 Test your stomach and enter our soba noodle eating contest! 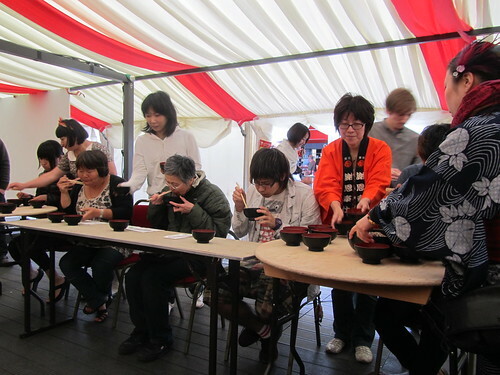 Eating contests are a popular addition to Japanese festivals – and Moshi Matsuri is no exception! 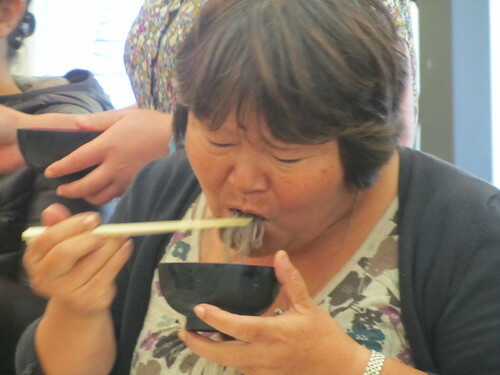 Whoever eats the most bowls of soba within the time limit will win a fabulous prize. 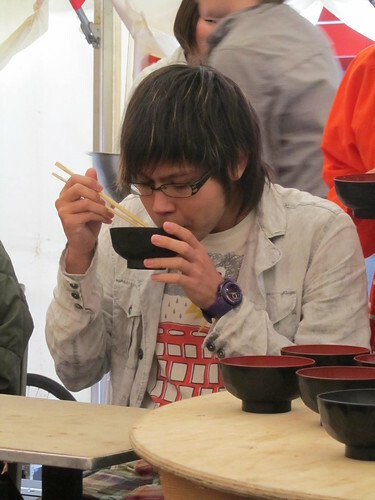 I was really surprised by the soba eating contest. I have to admit that while I was waiting for them to set up I did think to myself “why on earth am I standing here waiting to see people eat noodles? !” But actually it was really entertaining! 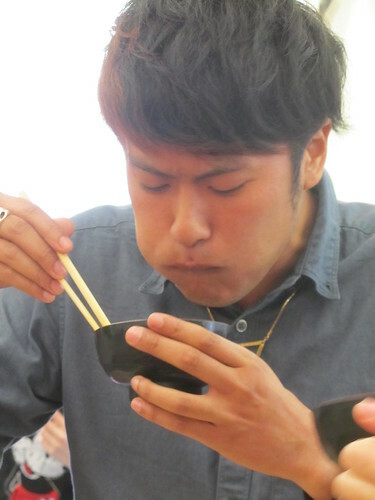 The winner (the young guy cheering in the last photo) ate 19 bowls of soba!! 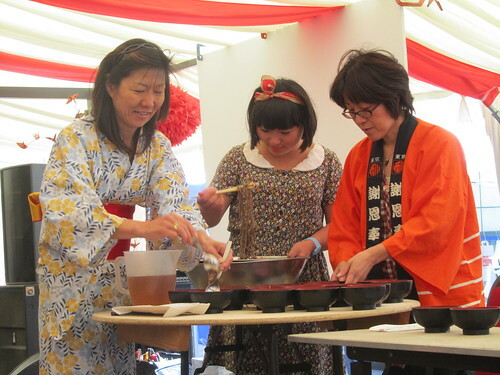 On both days of the festival I heard people muttering things like “it would be more authentic if they were Japanese” when watching non-Japanese performers doing traditional Japanese performances. I found this attitude rather strange, and surprising. 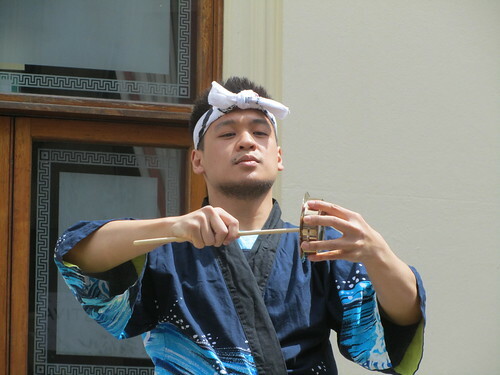 When I lived in Japan, on the few occasions I saw someone non-Japanese participating in a traditional Japanese performance (such as taiko drumming), the crowd seemed to be filled with nothing but admiration. 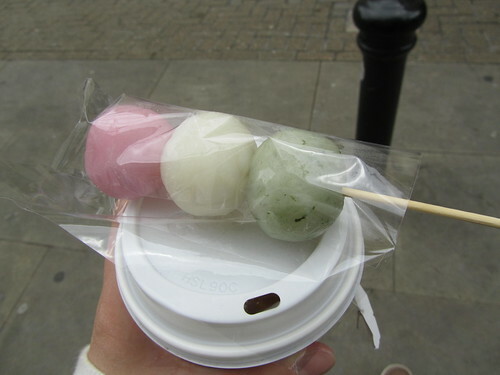 There was always a feeling of “Look – there’s a foreigner doing something Japanese! 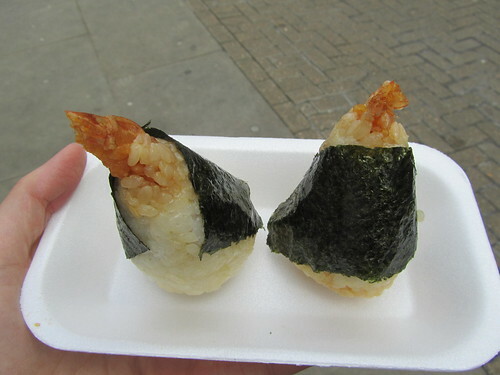 Look how well they’re doing!” Heck, I even got that response when using chopsticks sometimes! 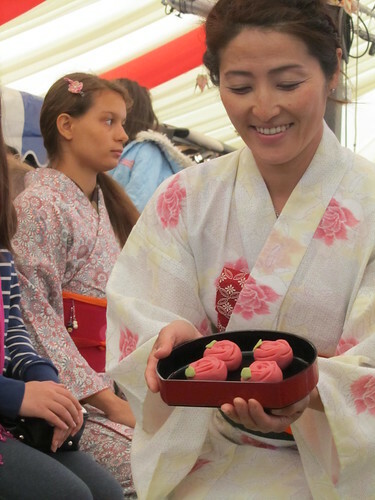 😉 I’m not saying that the general attitude in Brighton wasn’t good – far from it – but I think a few people didn’t really appreciate how much study, patience and skill go into learning a traditional Japanese art. 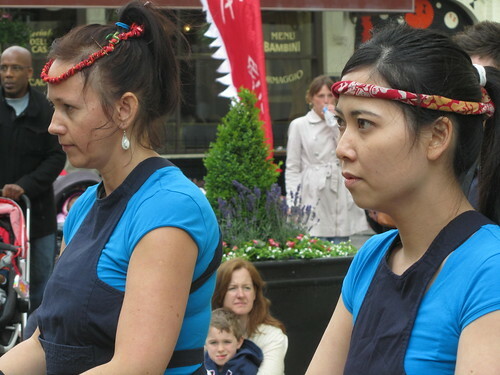 So, to all of those non-Japanese performers I saw, whether you were playing a taiko drum, wearing a kimono, playing a koto, doing martial arts or something else – well done! The world could do with more people like you – people who are willing to break boundaries and learn the fine arts of another culture. 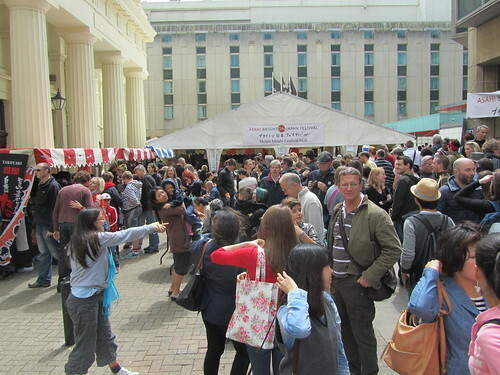 I thoroughly enjoyed both days of the Brighton Japan Moshi Matsuri, and I can’t wait to go back again next weekend for the Asahi Anime Festival. For those of you in the area, there are lots of other events taking place during this week. Unfortunately I can’t go to them, but please check them out if you have a chance! All the details can be found on the official website. All photos from Sunday can be seen on Flickr, and videos are on YouTube. Hah- the 2nd song you filmed the taiko group doing is the one I performed with my group on the beach in Hamamatsu ^_^ But interestingly it’s kind of a bastardised version of it. 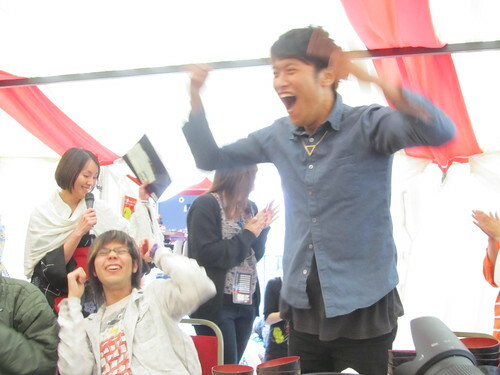 It’s actually a KODO song called Zoku which we played because our leader was from KODO. So we played the actual KODO version which was awesome! It’s my all time favourite song to play. This group has taken the main themes and mixed them all together in their own interpretation of it I guess. 😀 Looks like you had fun! Strange to see so many ‘foreigners’ in your photos…. and then realising it’s actually in the UK, hehe.